After the Fall of Rome, when many of the great ideas of the ancient world were lost to the ravages of the Dark Ages, three crucial manuscripts passed hand to hand through seven Mediterranean cities and survived to fuel the revival of the Renaissance--an exciting debut history. The foundations of modern knowledge—philosophy, math, astronomy, geography—were laid by the Greeks, whose ideas were written on scrolls and stored in libraries across the Mediterranean and beyond. But as the vast Roman Empire disintegrated, so did appreciation of these precious texts. Christianity cast a shadow over so-called pagan thought, books were burned, and the library of Alexandria, the greatest repository of classical knowledge, was destroyed. 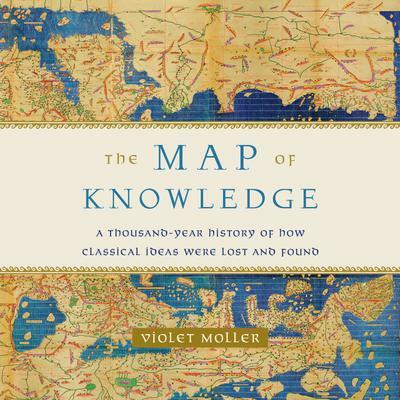 Yet some texts did survive and The Map of Knowledge explores the role played by seven cities around the Mediterranean—rare centers of knowledge in a dark world, where scholars supported by enlightened heads of state collected, translated and shared manuscripts. In 8th century Baghdad, Arab discoveries augmented Greek learning. Exchange within the thriving Muslim world brought that knowledge to Cordoba, Spain. Toledo became a famous center of translation from Arabic into Latin, a portal through which Greek and Arab ideas reached Western Europe. Salerno, on the Italian coast, was the great center of medical studies, and Sicily, ancient colony of the Greeks, was one of the few places in the West to retain contact with Greek culture and language. Scholars in these cities helped classical ideas make their way to Venice in the 15th century, where printers thrived and the Renaissance took root. The Map of Knowledge follows three key texts—Euclid's Elements, Ptolemy's The Almagest, and Galen's writings on medicine—on a perilous journey driven by insatiable curiosity about the world.